Obama vs. Welfare Reform: WHY?! Get out your slide rules and compasses, boys and girls. We’re about to dissect the whats, the hows, and wherefores of the wonderful and wacky world of welfare reform! Please, try and contain yourselves. Our story begins with this complaint from the Right: the White House has undone welfare reform! House and Senate Republicans introduced a bill Wednesday to prohibit the administration from implementing its latest policy … “eviscerating” planks from the 1996 bipartisan agreement on welfare reform. The list of laws [President Obama] won’t enforce or is unilaterally amending is getting long. …The latest and most inexplicable gambit is his decision to undo bipartisan welfare reform. So what happened exactly? And whatever it was, was it illegal? And whether or not it’s legal, what does it mean and does it matter at all? The implications are immense, but it was not illegal. In this article, I will first explain why the law allows President Obama’s unilateral move. I will then explain how the move undermines the much heralded welfare restrictions of 1996 and how it fits so well with White House welfare policies from the start of President Obama’s tenure. The work requirements of Temporary Assistance for Needy Families (TANF)are at the heart of concerns coming from proponents of welfare reform. President Clinton’s 1996 signature law forced states to put at least 50% of their welfare recipients through “work activities,” and proponents believe this requirement was essential for the subsequent mass migration into the workforce of former welfare recipients during the late 1990s. These proponents are now up in arms because the recent White House memorandum (July 12) from the Department of Health and Human Services (HHS) offered states a waiver from their work requirements. What was the stated legal justification? HHS claimed authority under §1115 of the Social Security code to waive the work requirements. But the work requirements are stated in §407, which §1115 conspicuously does not cover. However, HHS (brilliantly, in my opinion) located a loophole: it turns out §1115 does allow the waiver of §402, which itself implements the work requirements of §407. While the TANF work participation requirements are contained in section 407, section 402(a)(1)(A)(iii) requires that the state plan “[e]nsure that parents and caretakers receiving assistance under the program engage in work activities in accordance with section 407.” Thus, HHS has authority to waive compliance with this 402 requirement and authorize a state to test approaches and methods other than those set forth in section 407, including definitions of work activities and engagement, specified limitations, verification procedures, and the calculation of participation rates. All signs indicate this move to be legal. Whether it is good policy is another question entirely. Helping a friend or relative with household tasks and errands. Working requirements must be present, they must be tough, and they must be enforced, so the argument goes. The stated intention is to allow states more room to try programs that promote employment for welfare recipients in the face of the recession. The actual language is rather strict and rules out a number of potential waiver applications. For example, the memo states, “The Secretary will not use her authority to allow use of TANF funds to provide assistance to individuals or families subject to the TANF prohibitions on assistance.” Translation: people who aren’t on TANF because they didn’t meet the work requirements aren’t going to get bailed out here. This is simply disingenuous. True, the prohibitions on assistance he refers to are in §408, which are not subject to waiver. However, these prohibitions on assistance are not work requirements. If they were, then the work requirements of §407 would be superfluous. Indeed, the entire HHS memo would be an embarrassing waste of time. It is not helpful to pretend that a policy lifting work requirements will not effectively lift work requirements, without further exposition. Proposed waivers also must include concrete methods of evaluating performance, and set standards that the new programs must meet for the waiver to continue. To paraphrase Klein, one man’s concrete methods of evaluation is, of course, another man’s free-for-all. As noted above, the HHS memo requires things like “definitions of work activities and engagement, specified limitations, verification procedures, and the calculation of participation rates.” These requirements are further detailed at the bottom of the memo. The implication that any of these requirements will subject the states to any substantial limit is a wild guess at best and is made with willful disregard of the mechanics of government at worst. This is especially true because the memo is just a letter — a ‘heads up’ to the states — without the force of law. In a nation governed by waivers, this kind of naïve, unquestioning analysis just won’t do. Klein notes other potential positives of this welfare “tweak,” such as financial protection for some in need. Assuming welfare to be a net benefit for its recipients, granted. However, if our concern, for whatever reason, is the expanding of welfare payments at the expense of work requirements — the very concern that made welfare reform popular in the first place — the policy directive in this memo is anathema. Make no mistake: we have just experienced an about-face of welfare reform. If you thought this just couldn’t get any more riveting — if you thought only the first drop on a roller coaster at a Red Hot Chili Peppers concert could top this — oh, it’s going to get so much better! It’s time for some context before we cover what the Obama Administration has been doing with welfare reform since its very first days in office. The same paper details that combined federal and state welfare since LBJ’s 1964 promise to fight poverty totals nearly $15 trillion. This means the projections for the next 10 years ($10.3 trillion) equal more than 69% of the last 40 years of spending. That’s total welfare. However, this article’s object is not total welfare, but only the single program that was reformed in 1996 and whose reform was just “gutted” by the HHS memo. Obviously, TANF is by no means our greatest concern regarding unvarnished welfare spending. To my mind, then, TANF is not itself a crisis, unless it expands astronomically. 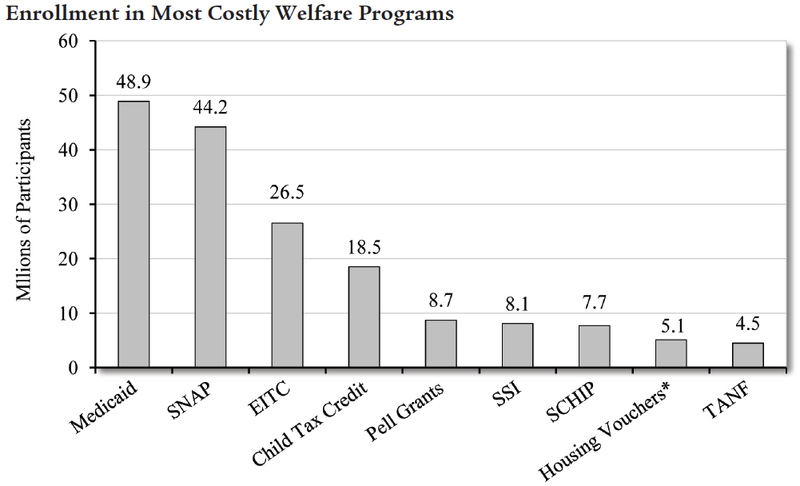 However, as the numbers in the CATO paper indicate, the entire welfare establishment of 126 programs is in crisis and any expansion in any program does contribute to the problem. Indeed, CATO details several recently-expanded programs, including TANF. This is why an eye on TANF is important, but always in conjunction with its sister programs. To understand the last three years of TANF, a short stroll through the glorious days of the 1990s will clear a few things up. To recap, TANF is the post-reform moniker of Aid to Families with Dependent Children (AFDC), which gained its unpopularity because too few strings were attached to its welfare benefits, and too many people were taking advantage of readily-available tax funds. This program was colloquially considered “welfare,” even though it is only one of many welfare programs. And so, part of the 1996 Clinton welfare reform was the mandate that, in order for states to receive federal funding, at least half of their recipients had to be involved in some kind of “work activity” (i.e. workfare, job search, training), as defined in §407. The states’ hands were tied to the work requirement. But if one state had 10,000 people on welfare and 5,000 dropped off the rolls because the work requirement drove them into a job, the state would still have 5,000 recipients left and would have to force half of them into work activities as well, until a de facto 100% work requirement materialized. In short, the HHS Secretary will take the number of families on welfare in 1996, subtract the amount still on welfare in a subsequent year, and use that difference to credit the state for the number of families that have left welfare rolls. That was the caseload reduction credit and it is generally considered to have successfully induced states to reduce their caseloads by pursuing work requirements. As mentioned above, TANF requirements were strengthened in 2005. 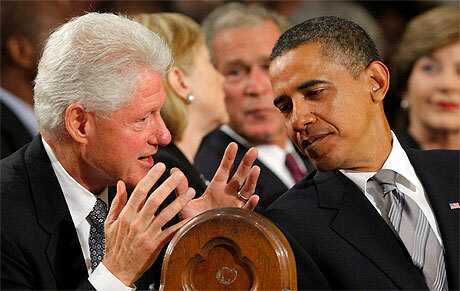 However, the 2009 Stimulus was the first major turn-around for the program since its 1996 reform. The funding was thus tied to increased caseloads, rather than to some measure of need, like increased unemployment or level of poverty. Proponents of the stimulus plan might argue that these changes are necessary to help TANF weather the current recession. This is not true. Under existing TANF law, the federal government operates a TANF “contingency fund” with nearly $2 billion in funding that can be quickly funneled to states that have rising unemployment. It should be noted that the existing contingency fund ties increased financial support to states to the objective external factor of unemployment; it specifically avoids a policy of funding states for increased welfare caseloads, recognizing the perverse incentives this could entail. If the authors of the stimulus bills merely wanted to provide states with more TANF funds in the current recession, they could have increased funding in the existing contingency fund. But they deliberately did not do this. Instead, they completely overturned the fiscal and policy foundations of welfare reform. Either this was a major oversight by White House lawyers or they were indeed intent on undoing the structure of TANF for the express purpose of undoing the structure of TANF. Additionally, the 80% payment is at the high end of what the federal government paid state governments for AFDC coverage, which in 1995 was anywhere from 50% to 74%. The 80% Stimulus provision was certainly a brazen step in several directions — and all before President Obama’s tenure began losing its first baby teeth. I cannot find which year the “annual State family assistance grant” refers to and whether it refers to all of TANF or part of it, but we might as well stop nitpicking here and be charitable enough to allow that the temporary welfare expansion in the Stimulus was limited both by time (1.5 years) and money (50% of annual grants per state). However, the fact remains that the Stimulus had, for the first time since 1996, incentivized the increase of caseloads, for caseloads’ sake. One thing held this shift back: the caseload reduction credit, which was so critical in incentivizing the states to lessen their caseloads back in 1996. The question here was, if caseloads expanded in response to the Stimulus’ 80% federal welfare bonus, wouldn’t the caseload reduction credit be unable to protect the states’ funding? Would not the work requirements then kick in and force funding away from the states? What does this gobbledygook mean? Let’s take it one step at a time. The bottom line is that the Stimulus gave states the option to either stick with their current and real data points or use their 2007 (smaller) caseload data, in order to pretend that their caseloads have not increased, when, in fact, they had increased, due to the 80% Stimulus welfare bonus for increased caseloads. This was an option available during fiscal years 2009, 2010, and 2011. Because fiscal years end on the September of their year, this program ended at the end of FY2011, or September 2011. Indeed, the caseload reporting exemption in §2101(b) was struck from the text by §2101(d)(2), which is explicitly effective October 1, 2011. To summarize where we’ve been so far: the 80% Stimulus TANF bonus, defined by a $5 billion total block grant, was subject to a 1.5-year limit (Feb 2009 – Sept 2010) and another limit having to do with specific state welfare budgets. Meanwhile, the caseload reporting exemption we just explored lasted 2.5 years (Feb 2009 – Sept 2011). According to HHS, all $5 billion of Stimulus bonus welfare funds were drawn down by the states within the two-year limit. So what happened in FY2011 from October 1, 2010, to September 30, 2011? The caseload reporting exemption remained, but Stimulus funds had run out. The Temporary Assistance for Needy Families block grant program was scheduled for reauthorization in 2010. Congress, however, did not work on legislation to reauthorize the program and instead extended the TANF block grant multiple times. The most recent bill, the Middle Class Tax Relief and Job Creation Act (H.R. 3630), extends the block grant through the end of fiscal year 2012 (September 30, 2012). Previous extensions included: the Claims Resolution Act (P.L. 111-291), H.R. 2943, and a two-month extension through February 29, 2012. [These extensions] did not include the TANF Emergency Fund, created by the American Recovery and Reinvestment Act. For a year and a half, then, the Obama Administration has not successfully extended TANF as they would like — without work requirements. The Stimulus was able to extend TANF by $5 billion over two years without work requirements, but between October 2010 and today, not only was the bonus not extended, but, with a Congress unable to pass an annual budget, it hasn’t even been easy extending even the old, boring TANF program. This must be exceedingly frustrating for President Obama, who, as early as 1999, was waging an admirable war against welfare restrictions. He must be particularly nonplussed with the fact that between 1990 and 2008, “[e]x­penditures for every program except TANF increased in real terms.” (CATO, p.6) If one’s goal is the extension of welfare, then TANF is the single greatest welfare failure of the past two decades. 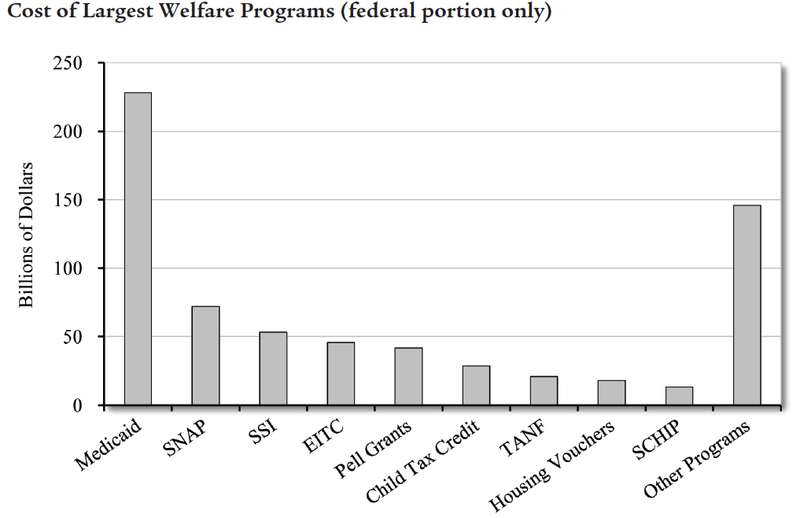 President Obama has obviously been far more successful in extending other welfare programs. His troubles with TANF are only ever more stark when compared with his success, for example, in increasing food stamps, or the Supplemental Nutrition Assistance Program (SNAP) over the course of the last three years: “enrollment [in SNAP] increased by 12 million people, while spending increased by $30 billion.” (CATO, p. 8) A record 45.8 million recipients now benefit from SNAP. With such a juxtaposition, and in conjunction with the history thus recounted, is it really such a surprise that President Obama simply decided to unilaterally lift the TANF work requirements this month? A better question is why he waited all this time.